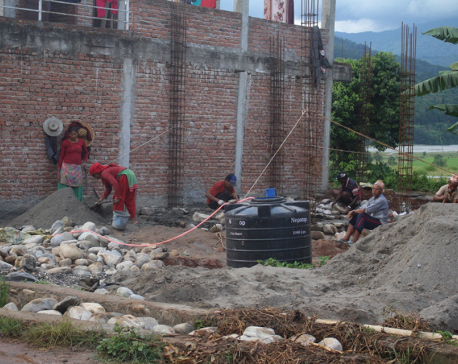 GORKHA, Feb 1: Reconstruction works in northern Gorkha have been halted for a week due to a heavy snowfall. The snow that fell a week ago has not melt. 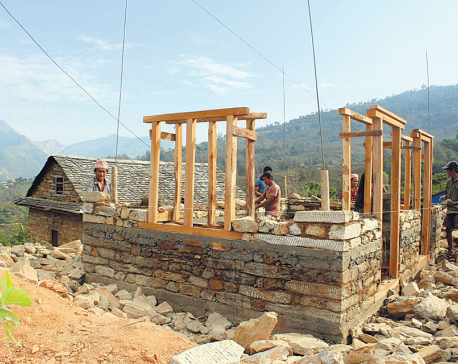 The snowfall in last week has obstructed the reconstruction works of the integrated settlement in Laprak of Dharche Rural Municipality-4 which is being reconstructed with financial assistance from the Non-Resident Nepali Association. According to engineer Laxman Aryal, the reconstruction works will not start until the snow melts completely. “It has become difficult to step outside of the houses, let alone carry out the reconstruction works,” he said, “There was three feet thick snow. It seems that it will take another week for the snow to melt.” He added that the water flowing out of the melting snow has also made it difficult to carry out the reconstruction works. The reconstruction workers have been left idle for a week due to the halt in reconstruction. About 150 personnel from the Nepal Army and the locals were carrying out the reconstruction of the integrated settlement before the snowfall. For now, the workers have been left in the camps where they are spending their days by warming themselves around fire and eating warm food.